Reddit is a website dedicated to curating links on different topics. If you can imagine it, there is a probably a /subreddit/ (Reddit category) about it – everything from /WorldNews/ to /PicturesofIanSleeping/ (which is a mix of bizarre and outright creepy). Links are then voted up or down by the readers to help others work out what is worth reading, and what isn’t. A thread for interesting peer-reviewed research (either the journal articles, or news summaries of the research). There is plenty of stories of animal research discoveries every day. They also do regular AMAs (Ask Me Anything) with scientists. Most recently Prof Peggy Mason, who does research into empathy in rats, conducted an hour long AMA where she answered questions (among many others) on rats’ ability to identify each other, and the existence of psychopathic rats. A very new subreddit dedicated to discussing recent animal research. 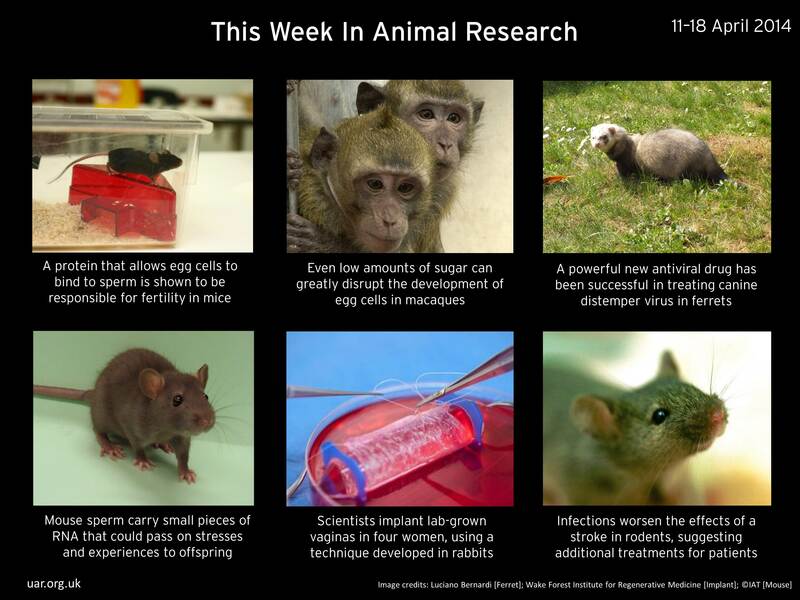 It also posts a weekly image entitled “This Week in Animal Research” (see below), looking at some of the biggest breakthroughs of the week made possible thanks to animal research. A place for people to ask their scientific questions to a group of scientifically minded peers. Questions cover all manner of scientific interest, though animal research comes up semi-regularly such as this question on “what really happens” in animal testing facilities. Created to fill a gap in /Science/ for science stories that are not directly based on peer-review research (most science news stories, sadly). It also includes more videos and images about science. IAmA is a subreddit for people with something uncommon about them (their job, hobby, achievements etc) to be asked questions. It contains a mix of scientists, sportsmen, and others as well as the occasional big-name celebrity (e.g. IAmA from President Obama, Richard Attenborough and Tim Berners-Lee [For any NBC anchors – he’s the guy that invented the internet]). IAmAs typically last one hour or so. Time to get involved. The discussion on animal research is happening across the internet, and Reddit is one of the bigger communities. So it’s time for you to join in. Somewhere there will be a subreddit for you. Though it’s probably not this one. Posted on April 23, 2014 May 2, 2014 by EditorPosted in News, Outreach NewsTagged animalresearch, everythingscience, iama, reddit.